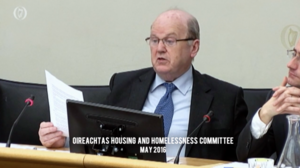 Minister for Finance Michael Noonan was recalled talking about vulture funds at an oireachtas committee on housing and homelessness – in May 2016. 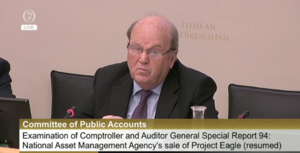 …Mr Noonan faced questioning in the Dáil from the former Labour Party leader Joan Burton. Richard Boyd Barrett: ‘Will the Minister provide details of meetings held between his Department officials and vulture funds during his terms as Minister for Finance; if he or his officials suggested to these funds that they might benefit from tax loopholes such as section 110 of the Taxes Consolidation Act or any other tax loopholes for the purposes of minimising their tax contributions; and if he will make a statement on the matter. 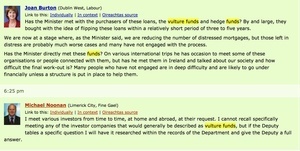 Posted in Misc and tagged Michael Noonan, Vulture funds at 5:20 pm on January 10, 2017 by Broadsheet. Noonan is a sociopath IMO. A despicable odious cretin, with nothing but disdain for the Irish working class and middle class for that matter. The vindictiveness, the contempt, the casual dehumanising of the victim- was made plain and widely known when details of the dealings were made public. And yet it was no obstacle to Noonan becoming leader of Fine Gael, and later Minister of Finance. + 1000. A political degenerate. Eh, I don’t remember being consulted when USC was brought in to see if I was happy with it and how it could be watered down to not actually be effective, but to just be seen to do something. 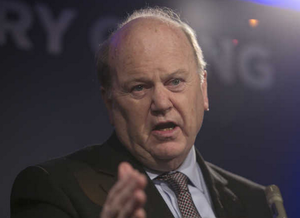 Noonan’s been bought and sold and he hasn’t an ounce of decency about him. You’re not a person though. Know your place. I love the way he even has a sleeveen voice just in case you hadn’t made up your mind about him. Here is a guide from Davys on using QIFs and Section 110s (and the difference). Remember, as a public document, Davy can’t “spell out” the tax implications in neon lights. You will just have to read between the lines of what Davys say to understand what is going on here. However, you will see that at the end of the document, Davy’s have created a new hybrid – the Super QIF. This is a QIF but with a Section 110 vehicle between the asset and the QIF (i.e. In the above analogy, like getting the hose pipe stuck into your bucket. As I pointed out in earlier posts, the new rulings that Revenue have being putting in place to protect the vulture’s Section 110 domestic Irish tax avoidance schemes..
but as we have seen in earlier posts, Irish Revenue have bent over backwards when it comes to helping foreign funds in Ireland evade Irish taxes. It doesn’t take too much reading between the lines either reading the brochures from the likes of Davys. Limiting tax liability to effectively being nil is what I’ve seen. You’re out of your depth. Post articles and cherry pick quotes all you like. That doesn’t mean you understand it , let alone argue it. You don’t know Anne’s modus operandi. Go easy on her. She’sa bit lost now that David Williams has gone quiet. Curiously he’s revered as some type of seer by FG types. A talentless, snide, sneering, over-promoted, arch gombeen. a few billion buys alot of TDS but the crazy thing is FG/FF are just unqualified pseudo county councillors regurgitating half understood Chicago school shibboleths while carrying out EU orders to the tea so that no one gives them the stink eye in Brussels. He’s not too bad at picking at the carcases of his fellow citizens himself. Probably the most hated politician ever in this country,and that’s saying something. Hopefully he won’t be around for much longer. Odious doesn’t even come close. Repulsive in heart and mind, without sympathy or empathy. ….seeks similar for fun times and maybe more. Maybe more? A nudge over a steep cliff? Who wants to do the pushing? Just watching the 9 O’Clock News on RTE .. they announced evictions have been issued down in Limerick, by a vulture fund. Baldy’s home town. More details now shortly..
OakTree -Vulture Fund, want to sell up.. 3 months notice given. The Strand, Limerick. Sold to them by Nama. And absolutely par for course. The man is a literal poo. You could be killed in the stampede. How abusive Mildred how could you? Where’s Father Kieran out of the New York parish to pour holy cold water in your general direction??? I’ll show him the same respect he shows the public, absolutely none. Irelands economics are failing its people. Noonan has ruined the lives of thousands for the foreseeable future by letting Vulture funds do what they want, no matte how immoral, AND to add insult to injury, they let them do this Tax Free! On hundreds of millions of Euro! Its sickening really. make it up……its time we were rid of him. Retrospect is a fine thing, are we forgetting how goosed the country was at the time? The banks were about to go under and everything was on the table, you people seem to be overestimating the strength of our hand at the time. To say the situation as it stands now is distasteful is an understatement but apt as the countries economy at the time was akin to a rotting corpse, the best we can do now is establish legislation so our kids won’t have to deal with this sort of situation in the future. Oh right. Or the plaintiff could admit liability? This is the standard evasive response the contemptible baldy coot comes out with. He knows well who he met, but he wants the TD to specify the exact company he met with, and he’ll check the records at another time. I mean is he implying he’s going a bit senile and can’t really remember wining and dining with these Vultures in New York, because that’s the implication of his response? 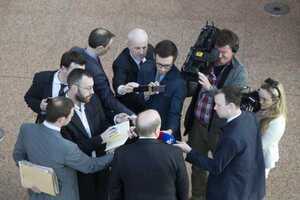 He’s evaded questions on numerous occasions in this usual contemptible manner. Didn’t Catherine Murphy received the same responses from him in relation to the Siteserv sale to Denis O’Brien and the massive write off he got? He gave as little information as possible in a drip feed manner and wanted specifics questions asked before he would give an upfront answer. She had to go digging and submitting FOI requests over and over to put a picture together of what happened. And it was shown afterwards that the Dept of Finance and Baldy knew and had concerns of the write offs and shareholder pay off. He clearly feels like the Irish public have no right to know how the country is being run… how billions in taxpayer’s money is being used. It’s not acceptable and he’s shown he has nothing but contempt for the Irish people. What he’s done to this country is treasonous IMO and the legacy of his actions will be felt for generations.